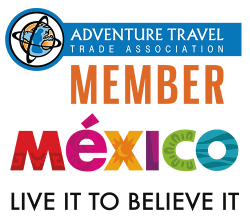 If you find yourself in Veracruz and you love outdoor action thrills, then this day of adventure is for you. It is all about long stretches of sandy beach sandwiched between two “seas;” the Gulf of México sea and a sea of steep sand dunes which seem to continue on in all directions in a roller coaster of one hill after another. This is the perfect place for an excellent day of ATV riding and sandboard surfing. 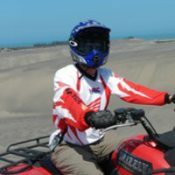 No prior experience is necessary as your bilingual instructor will teach you how to operate your ATV & give you the necessary techniques for sandboarding down the dunes. Bring your suntan lotion, your enthusiasm, and your sense of adventure. Go ahead and sign up for this most awesome 2 hour tour! Minimum Age: 6 years old when riding on an ATV with an adult. Must be 16 years old to ride solo. – Take a local bus from the Veracruz bus station to the town of Cardel. We can pick pickup & dropoff from there. Upon arrive, you will meet your bilingual guide who will give you an introductory lesson about how to operate your ATV. Then your ATV ride and sandboard surfing adventure begins when you put on your helmet and goggles to start your journey riding onto the beach where you can zoom down the flat coastal hard-packed sand dodging the ocean waves until you reach the “sea of dunes.” On this 2 hour tour, there will be plenty of time to get photos and video of the great ocean views from high up on the precipices of these sandy mountains. Your ATV guide(s) will lead you up and over through the maze of seemingly endless dunes. At one point, everyone will stop at the precipice of one of the dunes and your guide will then prepare you for the next adventure challenge; sandboard surfing. It’s a blast as you slide down the dunes on sand surf boards. Of course, if you do not want to do the sandboarding, then you will have more time to go ATVing. It’s your choice. After the tour, you have the option to enjoy the afternoon relaxing on the sandy beach, playing in the shallow warm Gulf of México waters, and enjoying a lunch (not included) at one of the small seaside restaurants. Later, if you have elected to use our transportation, we will drive you back to your hotel or to the bus station in Cardel. Cruising along on these dunes (ATV tour) and having the ocean waves in the background. It's beautiful!